General Finishes New Enduro Waterbased Pre-Cat Lacquer is an economical, high performing clear finish with good clarity and hardness. This Pre-Cat Lacquer utilizes new technology to the polymer manufacturing process. This new technology produces a smaller, smoother polymer particle that improves film clarity. Chemical & Water Resistance is improved and superior to competetive single component acrylic finishes or solvent based lacquers. This finish has an improved "wet look" on wood surfaces to enhance grain & color, but resists yellowing over time. 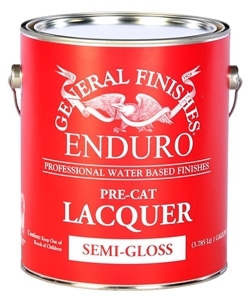 Enduro Pre-Cat Lacquer is a good choice for stained or bare wood projects such as interior trim, millwork, decorative furniture, entertainment units, built-ins, etc. Quick drying and recoat times make this a good choice for residential and commercial applications that require a minimal yellowing finish at an economical price point. Sprayable (HVLP or Conventional), not recommended for brushing applications.